Water is a hot topic these days especially in our immediate area of the Gallows Run Watershed and Nockamixon Township. The quality and volume of our water wells has been in recent newspaper articles and has been a topic of distress for some. Some experts consider water as the new “gold.” If that statement is only partially true, it must be understood. Viktor Schauberger, an Austrian forester from the early 1900’s and an expert on water stated, “The true foundation of all culture is the knowledge and understanding of water.” Our current societal culture is becoming increasingly more aware of this concept, hopefully not too late. Scientists and engineers have found that using methods to retain as much water on your property as possible is the best way to support a healthy natural water cycle. The rain that makes contact in your immediate surroundings should be collected or controlled to stay as close to the point of contact with the earth. 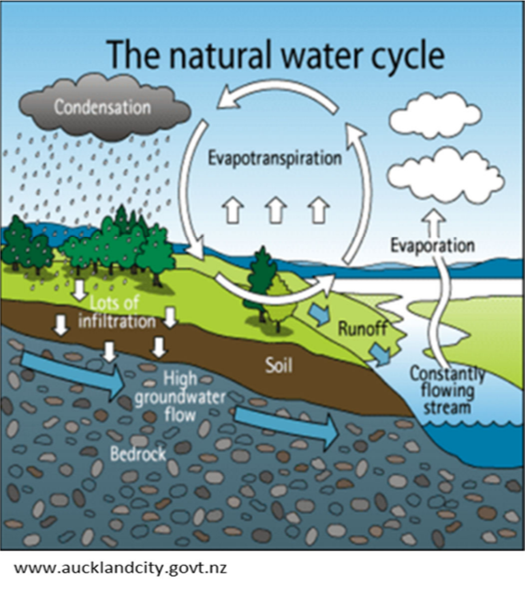 In an ideal natural water cycle the amount of rain converted to runoff is less than 10% of the runoff volume, roughly 50% of rainwater is infiltrated into the soil, and roughly 40% is evaporated into the air. Infiltration provides more water volume for water tables and drinking wells and evapotranspiration provides proper moisture content for healthy fauna, wildlife, and human habitats. This is extremely important in the Gallows Run Watershed and surrounding areas due to the large areas of bedrock that make it difficult for the water to be absorbed. There are a handful of techniques property owners can implement to assist in protecting their water table and ultimately their drinking water. One of the best ways to assist the natural water cycle on your property is to increase the pervious surface areas. Some ways to add pervious surfaces are to add a green roof or remove macadam driveways and replace them with stone or pervious macadam. Another way to control the water on your property is to divert your roof gutters to rain barrels, cisterns, or rain gardens. Rain gardens and bioswales naturally control water to slowly infiltrate into the soil and also filter the surface runoff. All of the mentioned water control methods contribute to a healthier water table by filtering the dirt from roof or impervious surface runoff and at the same time increase the amount of water collected on site and ultimately into your wells. These low impact water control methods support the natural water cycle as much as possible with the least amount of man-made impact to a site. Be a good earth advocate remove some macadam and design a rain garden or bioswale. You will be making your surrounding water table healthier. Maureen L. Purcell resides in the Gallows Run Watershed and is the owner of Purcell Engineering. She can be reached at info@Purcelleng.com.